Target old socks stuffed with plastic shopping bags. Each target shall be approximately the size of a male clenched fist, with a knot tied in the back of the sock to keep the stuffing in the foot of the sock, and with a tail of unstuffed fabric in the back. The targets will be secured to the ground with a 9” length of ¼” fiberglass rod spiking the unstuffed end of the target tail into the ground. Distance 5 targets are placed at each of the following distances: 5 yards, 10 yards, and 15 yards. There should be approximately 1 yard between each of the 5 targets across the range. Scoring Each target may be hit only once. Scoring is 1 point per hit on the 5 yard targets; 2 points per hit on the 10 yard targets; and 3 points per hit on the 15 yard targets. 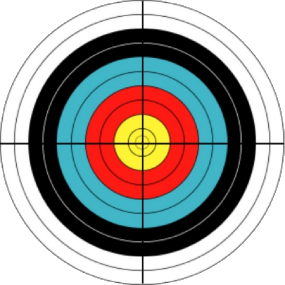 Any contact of the target (either stuffed or unstuffed areas) with an arrow or bolt counts as a hit. Shots do NOT have to be a full “stick” in the sock target to count as a score, therefore spotting by non-shooting archers is encouraged. Target The target is a two inch red or black duct tape stripe 36” long with two inch contrasting color duct tape stripes on either side of the center stripe.